This image was lifted from an astronomy book. 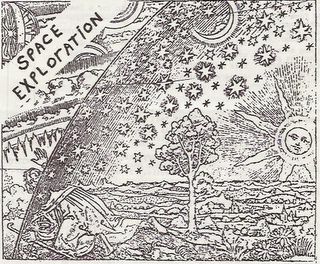 It depicts a medieval wood cut about peering behind the sky to see what makes the universe tick. I changed it a bit by adding the words, "space exploration." Congratulations to the Cassini space craft now orbiting Saturn and the Huygens probe that successfully landed on Titan. Great exploration in our day and good cooperation between USA and European Space agencies.